MarksvilleandMe: Kids Play & Learn Giveaway Spectacular! 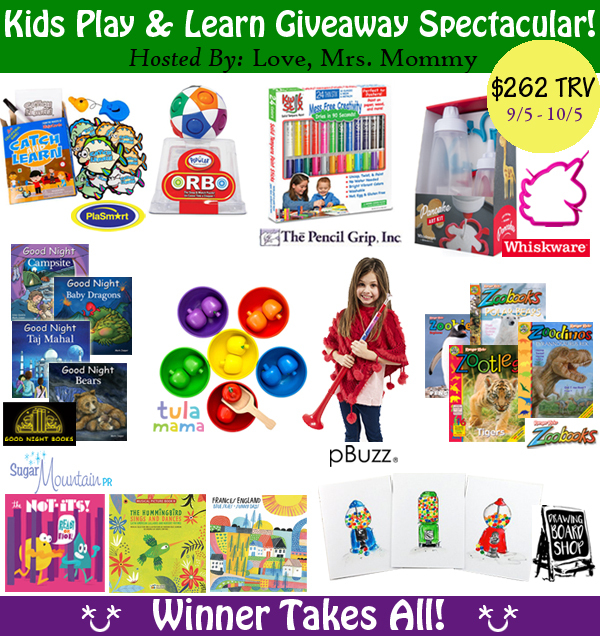 Kids Play & Learn Giveaway Spectacular! A 24-pack of Thin Stix! Solid Tempera Paint that's super quick drying. Includes 12 classic, 6 neon, & 6 metallic colors. $24.99 RV! Winner's choice of a year magazine subscription to either; Zoobies (0-3 years), Zootles (3-6 years), Zoobooks (6-12 years), or Zoodinos (5+ years). $29.95 RV! Winner's choice of any 4 high-quality board books! Up to a $40 TRV! CDs from "Ready or Not!" by The Not-Its! and "Blue Skies and Sunny Days" from Grammy nominated Frances England! Also included is a bilingual picture book w/ Spanish language songs and rhymes by Grupo Cantaro titled: "The Hummingbird Sings and Dances: Latin American Lullabies and Nursery Rhymes". $42.95 TRV! pBuzz is a fun, easy introduction into brass playing. It's specially designed for mini musicians’ little hands and is perfect for all ages! Great first instrument for mini musicians. $29.95 RV! What an awesome giveaway full of fun and learning.